September 6th: I awoke to a lovely sunny morning in Tralee. I went on a walk about before breakfast and met up with the group of cyclists I had spotted last night. I got talking to one man about their cycle. They were heading to Lahinch and then Galway. They were fundraising for cancer. He was a mixture of impressed and disbelieving when he heard I had cycled from Donegal into the wind and on my own. I almost felt as if I was a child in confession “bless me father I have sinned, I cycled into the wind and on my own”!!! I waited as they all gathered to take off. I felt a tinge of envy as I saw the outriders, ambulances and pick up cars as back up. 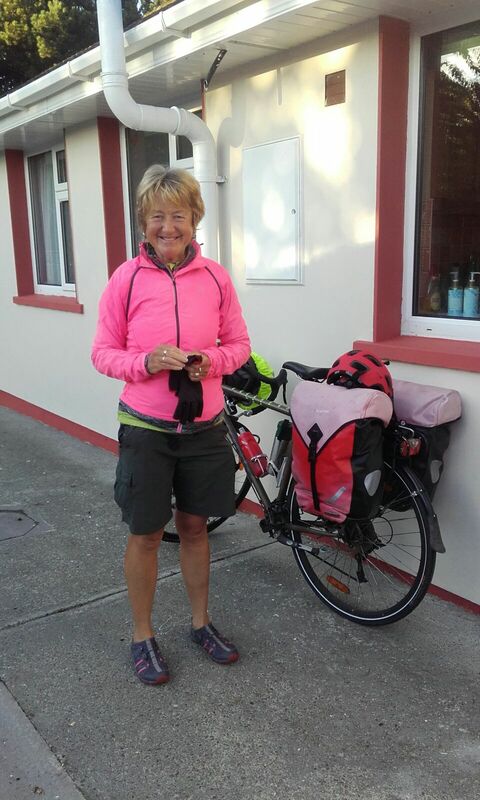 After breakfast I met Geraldine again for a coffee and a final check in as I headed out on the last stage Kerry/Cork of my odyssey. Dingle here I come. The sun shone as I cycled through Blennerville and out the road to Camp. 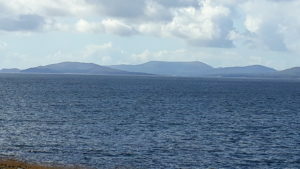 I love this cycle with the Atlantic on my right and looking across at Ballyheigue and Ballybunion. This was one of my practice routes last year up and down the Conor Pass proving to myself I could cycle up the highest pass in Ireland. I achieved this feat again and stopped to take in yet again this amazing cycle route. 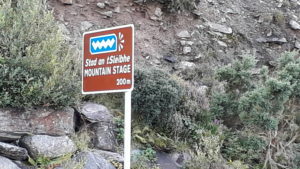 As steep as the cycle is uphill the downhill into Dingle is spectacular free wheeling all the way. I felt a broad smile sweep across my face as I arrived in Dingle. 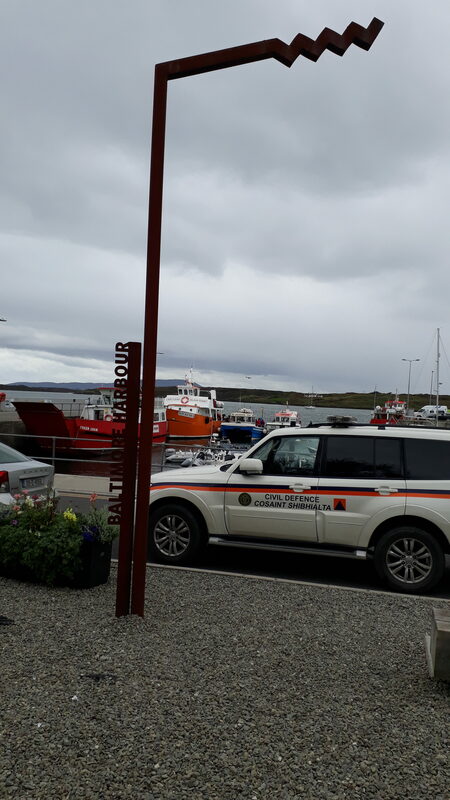 I stopped for a coffee and scone and just enjoyed being there watching the world go by, before wandering out by Slea Head. 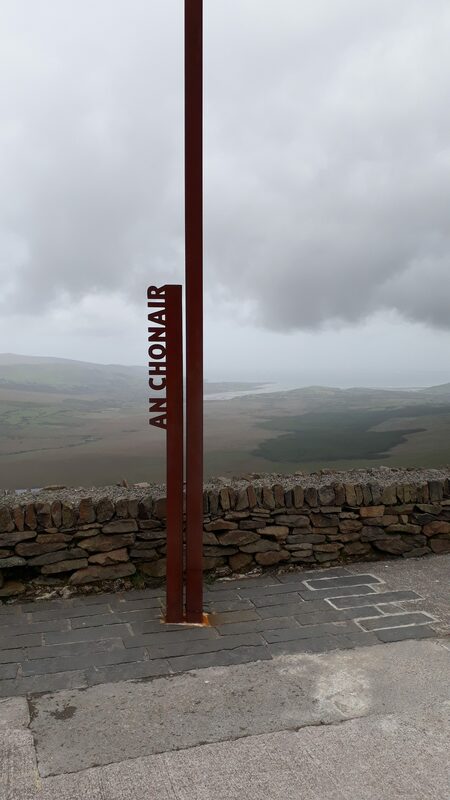 As I approached Dún Chaoin the sun disappeared and a dull grey sky accompanied me to Campail Teach an Aragail my favourite place in the world. Gráinne was there to meet me with our new tent and equipment. I was greeted by TP and Sorcha the owners of the campsite as if I had circumnavigated the globe! I could feel a surge of pride run through me as they questioned me about the trip so far. This couple have made our regular visits a source of delight and joy. I also get to brush up on my Irish as they are native speakers. After tea and chat we pitched our tent and drove into Dingle for a bit to eat and an Irish music session. We intended to stay for a few days and chill out but if I thought the weather was bad up to now it was set to deteriorate rapidly. Rain, rain and more rain fell and the forecasts were getting worse for storms and high winds. I reassessed my plans and made a decision to cut down the distances and to stay 2 days in some places from now on. September 9th: We took down the tent, packed the car and Gráinne drove to Castlemaine. We had a late breakfast and I packed the bike, set the Garmin and hit the road for Cahersiveen. ” I am in the Sive Hostel tonight with the intention of getting up early tomorrow to arrive in Sneem before the wind gets too bad. I am reduced to watching each weather forecast as I enter the last week of this odyssey. I am getting tired of each day having to worry about the weather- Will I make my venue? or will I get stuck? …its just exhausting. 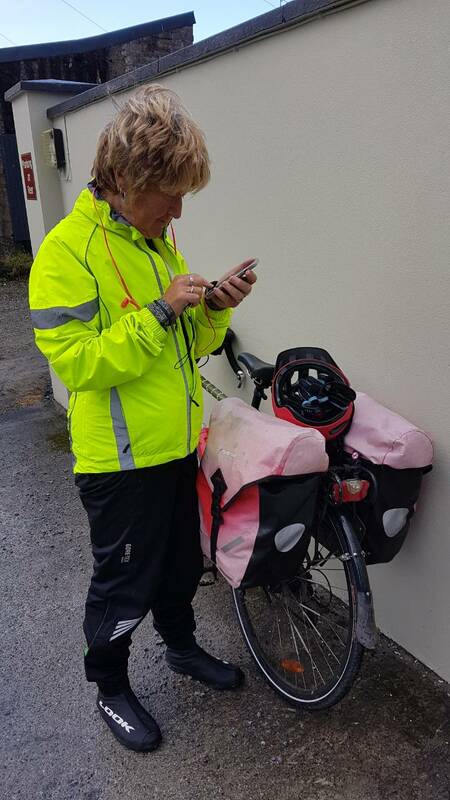 I was so very lonely leaving Dingle and then Gráinne …this trip has me all over the place….I love the physical aspect of it and the simplicity of pack, eat, cycle, take a break, back on the bike, find my accommodation, shower, eat, write my diary, bed. As I get physically fitter each day I get mentally more and more challenged…. this ingrained habit of doing everything myself is showing up all the sad and lonely aspects of it that I have been able to keep under wraps until now…….. “ A quote from my diary which I wrote as I sat in the dining room in the hostel. The place was quite full with tourists some who had come to Cahersiveen in order to visit Skellig Michéal. I felt very sorry for them as the landlady had to break the news to them that no boats would be travelling out the next day because of the storm approaching. It is very hard to get on to the rock so they were very disappointed as there was no guarantee they would get out the next day either. September 10th: After an early breakfast and a chat with a woman from Canada who was telling me she had raised her kids and was now doing all the things she had wanted to do up to now but couldn’t, this included a visit to Skellig Michéal. She was sanguine about not getting there today. It was a lovely way to start the day being inspired by another. I packed up and left Cahersiveen in dull misty not yet too windy weather. 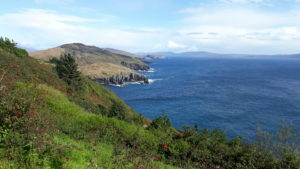 It is a beautiful cycle from Cahersiveen via Skellig Ring, with views out to Valentia Island, Commaciste, Waterville to Sneem. This is part of the ring of Kerry and full of spectacular scenery especially the view from Commaciste. Today was turning out not to be the day from admiring the scenery. 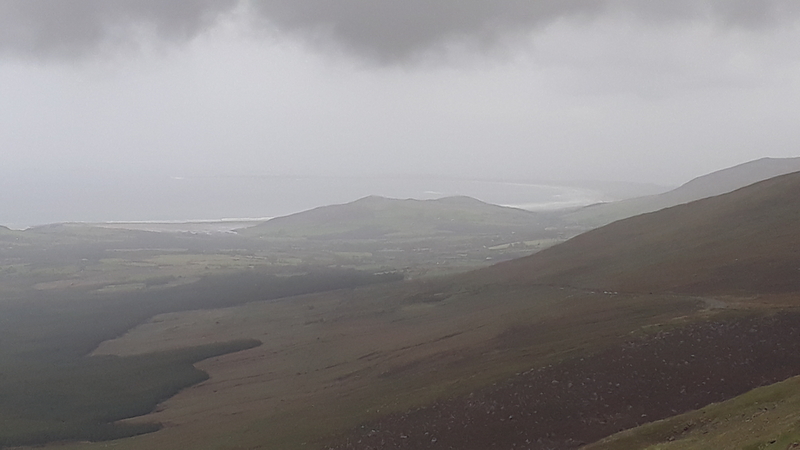 As I made my way up to Commaciste the wind began to get stronger and the mist heavier to the point that I had to get off the bike and walk a few times as the gusts were knocking me all over the place. The irony of this wind was it was actually at my back!!! But because it was so strong and gusty it was of absolutely no benefit. At one stage I heard myself screaming at it ” You are behind me now but you are worse than ever….of no use whatsoever except to keep knocking me off……GO AWAY…….” but of course the wind completely ignored me and just got stronger and stronger as we battled with one another until I finally reached Sneem. I had a very welcome lunch before looking for my B&B. It was lovely and I was given the Donegal Room” a bit ironic! After changing out of my wet gear and having the needful shower, I ventured out into the stormy wind -the rain had stopped- and sat in the local hotel reorganising the rest of my trip and booking some accommodation ahead. With the weather warnings the plan now is Kenmare tomorrow night, Castletownbere Tuesday and Wednesday, Bantry Thursday and Friday, Drimoleague Sat and Kinsale Sunday. September 11th: I left Sneem after a hearty breakfast and enough to make a lunch for later on. During breakfast I had a conversation with a couple from Holland who were walking the Kerry Way. They decided to give up as the ground was so wet underfoot and get a lift to Kenmare and then back to Cork. I didn’t feel so bad with all my complaining about the weather after listening to them. The wind eased up as I approached Kenmare. 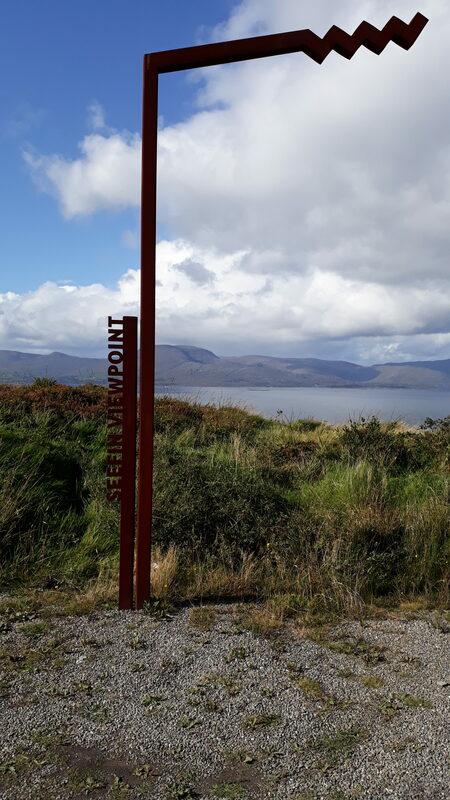 I saw a sign for Kilgarvan and had an idea in the back of my head that I ought to know this place- it is not part of the WAW. 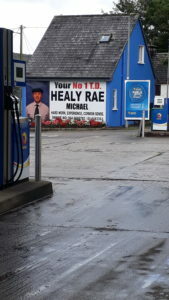 Off I took to check it out and look what I found-this is the kingdom of the Healy Rae’s the infamous T.D.s for South Kerry. They are true characters. 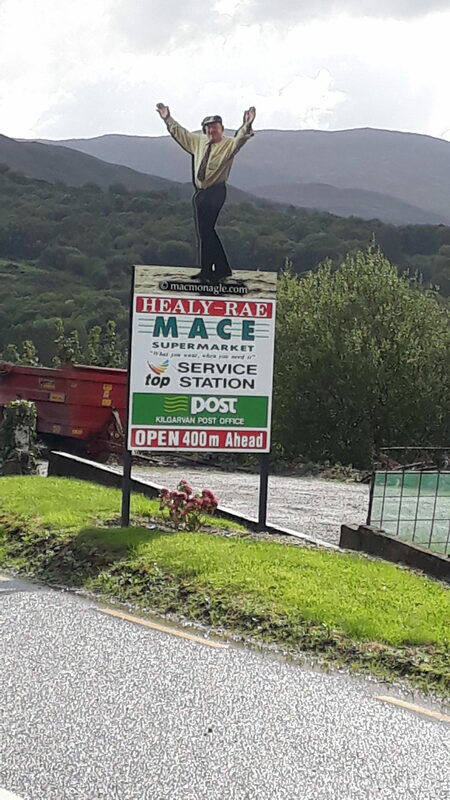 Jackie Healy Rae is perched on the first poster and now dead . His son Michael has taken up the mantel. I had landed in the heart of their kingdom so what could I do but buy a few bits and pieces in the supermarket and contribute to their economy. 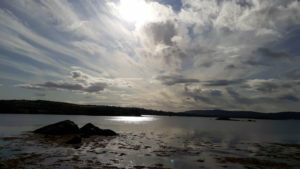 I returned to Kenmare in and out of showers and the wind which had returned. I checked into my hostel room, unpacked, showered and changed out of my cycling gear. This is truly a beautiful little town with lots of interesting cafés, shops, pubs and restaurants. I wandered around in and out reminding myself I could not buy anything as I’d have to carry it for a week. I settled for a new pair of waterproof gloves. Believe it or not it is actually very hard to find a pair of fully waterproof gloves as I found out each day I had heavy rain. I also bought the makings of my dinner and returned to the hostel to put it all together. I met a lovely young man from Belgium-his girlfriend was not feeling and was in bed-. We sat drinking tea as he told me about his life in Belgium. He is training to be a doctor We had a lot to compare and contrast about the two health systems. I’m sorry to say the Irish system came out badly. 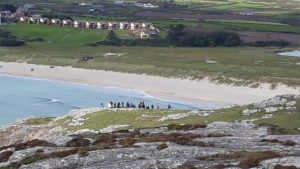 But we came out on top for friendliness and ordinary caring as he recounted to me some of the experiences they had as they walked the Kerry Way. At one stage he fell as he crossed a stream and all his clothes got soaked. The B&B they were booked into took them, washed and dried them free of charge. He was truly surprised and I was surprised that he was surprised- sure what else would we do???? The landlady had told me earlier that there would be music in many of the pubs around 7.30pm. I really didn’t believe her as so far all my experiences of music in pubs had started after 9pm and more like 10pm. By that time at night I was only fit for the bed! My doubts were short-lived as I wandered down the town. Passing one pub the music sounded good so in I went. It was full of tourists having dinner and enjoying really good traditional Irish music. And lo and behold it finished at 9.30pm. All I could think was how well the Kerry people know how to cater for tourists that do not want to stay up all night. Actually Kerry is the stand out place for tourism in my estimation. I sat up at the bar ordered a drink and started on my diary. I was so engrossed in writing that I didn’t properly hear a man a few seats down from me ask was I writing a book? I looked up when I realised he was addressing me and saw two Americans finishing dinner. I replied no, not a book just my diary of the cycle so I’d remember it! We got into a great chat. This was their first trip to Ireland and so far they were thoroughly enjoying themselves. I was delighted to be able to encourage them to visit different parts of the WAW as they had a hired car. They filled me in on their ever so interesting life in Pennsvlanyia. They were now into retirement and travelling to places they had had on their bucket list for years. We had a drink together and by the end of our conversation they had a plan for the rest of their holiday! I have become so much more comfortable chatting with strangers in pubs and having very interesting conversations to brighten my cycle. Each and everyone of them have been so encouraging about my adventure- hopefully it will begin to rub off on me by the time I end. September 12th: I left Kenmare at 8am with the intention of getting to Castletownbere before the weather deteriorated again as was being forecast. I decided to take the coast road and it was a good decision as it was truly beautiful from Touist to Lauragh. The road had overhanging trees and then spectacular views across to the Iveragh Peninsula. I was leaving Kerry and entering Cork the final county on the WAW. I stopped in Ardgroom for the coffee and scone break. 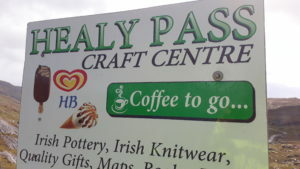 Yes I was finding my lovely coffee shops in all the towns and villages of Kerry. The village was painted in such beautiful colours as were the villages of Eyeries and Allihies. The were undoubtably the most colourful places so far, I came to my own conclusion that some very creative and courageous people must live around here, who were willing to risk creating villages full of delight. I decided as the weather was good -maybe the weather forecast was wrong???? 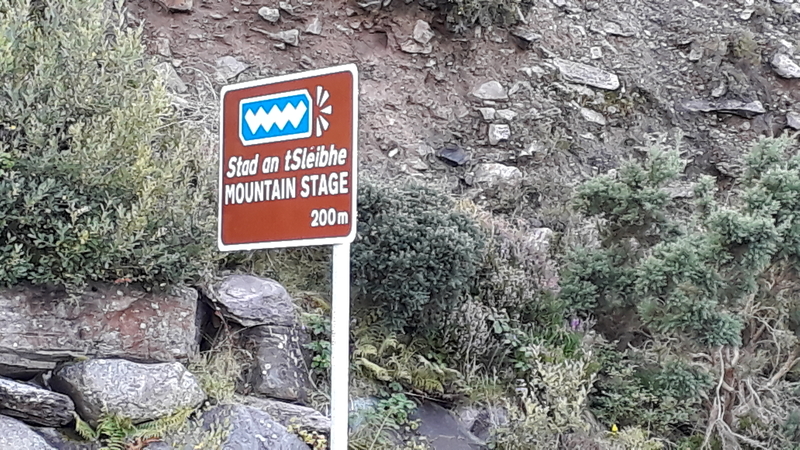 ?-I’d take in Allihies instead of taking the main road. Well I was no sooner out the WAW when the weather suddenly changed- as it can coming in off the Atlantic Ocean. The wind swept in from the sea and the rain lashed down. 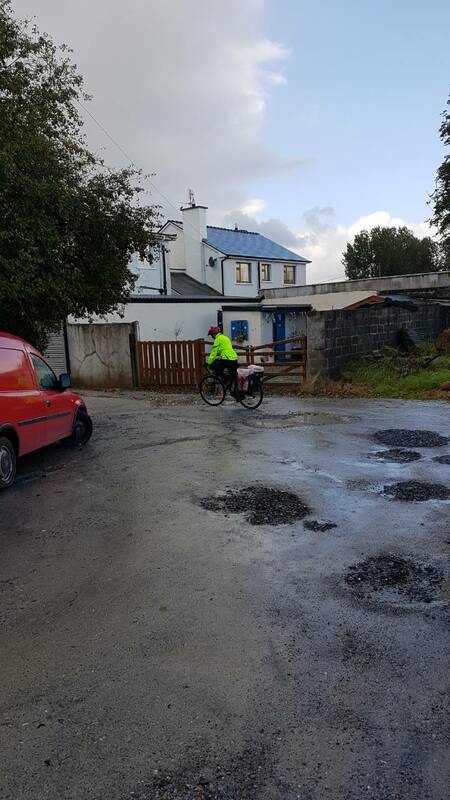 I saw nothing of the area and had to pass through Allihies with my head firmly down and focussed on staying on the bike. 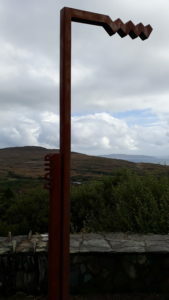 I passed Dzchogen Beara Meditation Centre. The only way I could identify it, was seeing some Buddhist looking flags blowing in the wind. 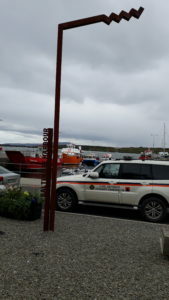 I had no idea how much further I had to go to reach Castletownbere as there was not a sign to be seen anywhere. Finally I saw a poster for a café so decide I must be near. I was praying it would be easy to find my B&B as by now I was like a drowned rat. Much to my delight the first B&B sign had the name of mine on it. Oh such joy to be at my destination. I was met by a lovely man who had no problem with me walking through the house dripping wet. Off with everything. I was thrilled to find I could put on the heat and dry everything. I collapsed on the bed and fell asleep for an hour. 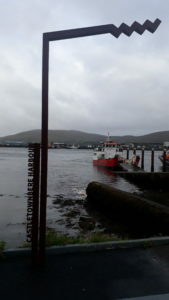 When I came to, I donned the now dry wet gear and headed off to check out Castletownbere. My landlord explained to me later that he thought the town was caught between Bantry in Cork and Kenmare in Kerry and tourists only used it to stop off. He was delighted I was staying 2 nights. 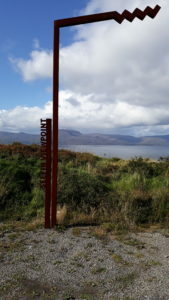 It is an actual working fishing town on the Beara Peninsula. 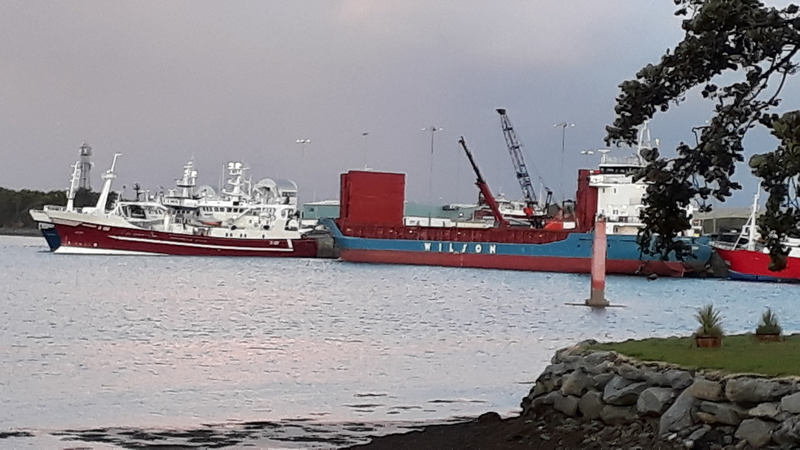 Some boats had come into the harbour sheltering from Storm Aileen. At last an official storm! I bought a few bits and pieces returned to the B&B and watched TV for the evening listening to the wind and rain hitting the bedroom windows. September 13th. It was an unusual experience to get up have breakfast and not pack up for my next destination. I felt a freedom to just explore the area for the day. The storm had passed and we were now back to normal wind and showers in the morning. 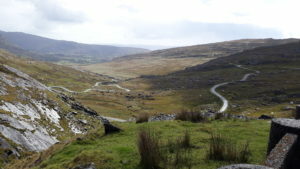 Off I took to the Healy Pass another nice climb with stunning views of both Cork and Kerry from the top. I decided to go up and down the same way as I wanted to visit the Dzchogen Beara Meditation Centre after all I had heard about it. I honestly have to say after my experience of Mamór Pass in Donegal no other climb has felt as difficult and I give myself full permission to enjoy the freewheeling downhill. I don’t think any photograph can ever give the full experience of the height of these hills. 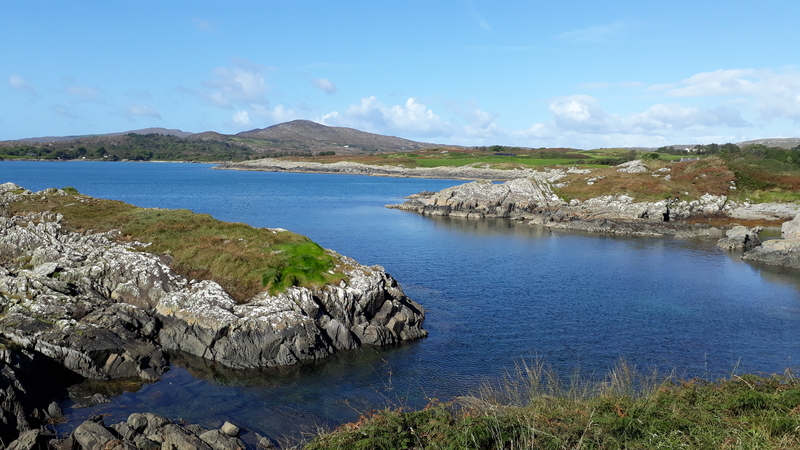 I returned to Castletownbere and continued on to the Dzchogen Beara. By now the showers had stopped and the sun came out. I spent two of the most calm and easy hours there. I had lunch in the café and a lovely chat with the man serving. I then sat in meditation, walked in meditation and generally gave myself permission to enjoy my time there. It was so good for me. The quiet, being alone yet not lonely. Sitting looking across at Sheep’s Head was so beautiful and calming. I felt an ease descend on me as I sat and contemplated this journey I was on. How it had become a cycle out of one life that I knew well and was now a cycle into the unknown. I knew as I sat there I could not return to life as I had know it in Recess for 27 years…something had to change and right now I did not know what that was. Dzchogen Beara seemed to lend itself to this kind of contemplation being ok. I sort of felt many people had passed through this Centre looking for something new, something meaningful in their lives. I had the sense of not being so alone in my quest for meaning, belonging, mattering. As I cycled away I took something with me. I was not a stupid person to have the feelings I was having. I was having a very difficult time, I was grieving the loss of a life as I had known it and somehow I was not alone in this. I began to feel grateful for Storm Aileen otherwise I would not have stayed 2 nights in Castletownbere and I would have missed this place. “You may encounter many defeats, but you must not be defeated.” MAYA ANGELOU sprang to mind. My cycle back to town was so beautiful as now I could see all I had missed yesterday. Back to my B&B. Shower, change back into my “civies” off to the local hotel for dinner, and my diary date. Back to B&B, packed my bags ready for the morning and then bed. September 14th: After breakfast and a nice closing chat with my landlord I packed the bike, set the Garmin and checked the Gopro for batteries. 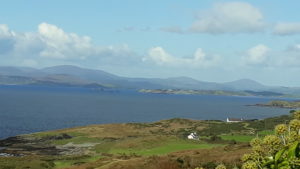 Left Castletownbere in nice sunshine and the odd shower, cycling through Glengarriff, Ballylicky and Whiddy Island in the distance. Yet again this is a very beautiful part of the country. 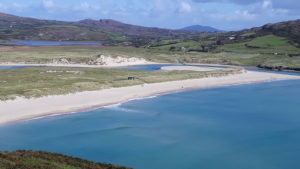 It has a micro climate which allows plants and trees not common in the rest of Ireland to grow here. 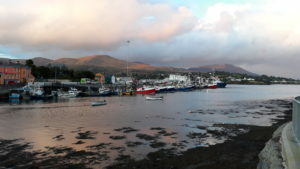 I very much enjoyed the trip to Bantry my destination for the night. Again I had my fair share of lovely coffee shops to choose from, for my now almost compulsory coffee stop! I arrived into Bantry round lunchtime. This was a bustling busy town and I received many different directions to my Airbnb. I think I saw an extra amount of the town as I was sent up and down streets that were nowhere near my destination. One woman confessed to having lived all her live in the town but could not figure out how to give me directions. Eventually I found it. Airbnbs can be harder than normal B&Bs to find as they do not have signs outside their houses. I was greeted by two very friendly people who had just started their Airbnb a few months earlier. They were fascinated by my trip and very keen to get the details of where I had been. This is my final time staying with friendly strangers and I’ll be here two nights. 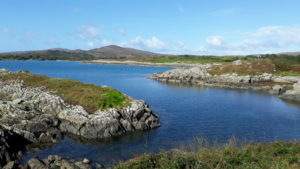 After my chat which at moments veered into a kind of interrogation about the trip, I unpacked my saddle bags, repacked a small bag and took off to explore Sheep’s Head Peninsula. This cycle was again spectacularly beautiful, up and down some steep little roads, sunshine all the way and my usual companion -wind. On my outward trip I met my second cycling group. There was loads of them all dressed the same, with cars to the front and to the back. 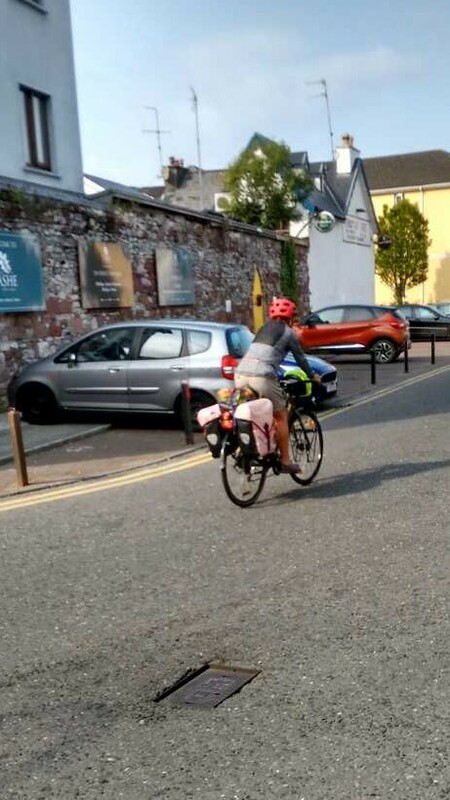 They were in bunches or alone all heading into Bantry. I’d find out later that they were cycling the inaugural WAW Cycling Sportif. This seemingly will become an annual WAW cycle in September for cycling clubs from abroad and Ireland. It looks very well organised and people are well taken care, and a good idea to extend the WAW season. As they passed me by I did feel a twinge of longing for their organisation and the company of other cyclists. 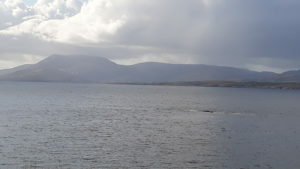 The longing actually grew inside as I cycled towards Seefin Point. When I got there I decided to let my cycle to Sheep’s Head tip go, as I was truly tired of being in beautiful places with no one to share them with. Just another few days of my own crazy-making company. I thought I’d try maybe something different this day-kindness. Yes it would be ok to let this part of the cycle go. I could return here in the future. I’m constantly amazed at how hard I find it to practice self-kindness. But today it was top of the agenda! So I circled back to Bantry enjoying the views, the whooshes down the hills and the sun on my face. I decided to have dinner before I went back to the B&B as it is a bit up above the town itself. The hotel I chose happened to be the same as the Cycling Sportif riders. They were all in the bar having drinks and meals, now my longing had turned to envy and a stronger resolve not to take this trip again without company to share it with. With that I decided to enjoy being on the edge of many people while I ate my dinner and wrote my diary. 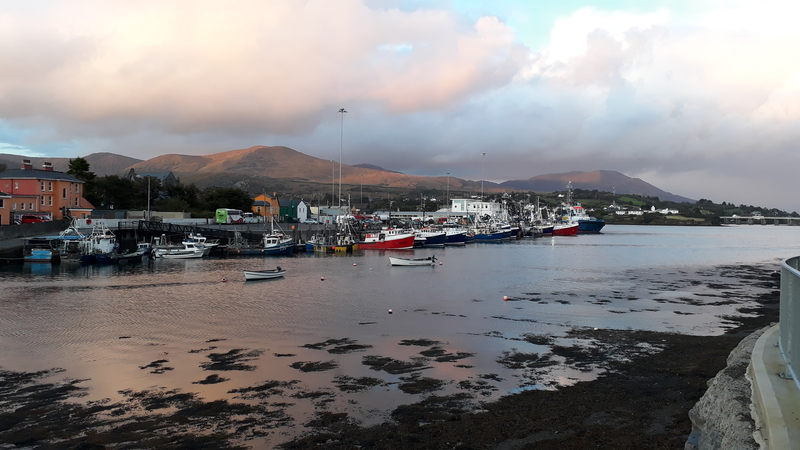 I had a nice walk around Bantry as I walked my bike back to the Airbnb. 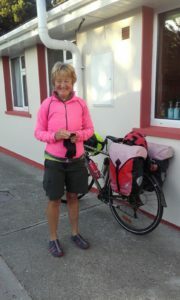 September 15th: After another very chatty breakfast I packed a little bag for my trip to Mizen Head and back. There was a farmers’ market starting up as I went through Bantry town. I stopped and stocked up with some lovely brown bread, rye bread and cheese. Stocked up for lunch for the next few days. 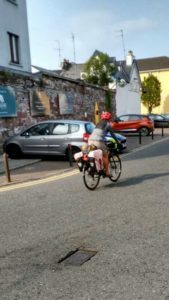 I cycled via Schull. When I was a teacher in the VEC in Cobh, Co. Cork being sent to Schull was like a “threat” if you misbehaved! As it was so far away those days -I had no car and Carlow where my family lived was days away I tried my best to behave! Years later when I visited Schull for the first time I was kinda sorry I had behaved!!!!!! It was and is a beautiful town in West Cork. 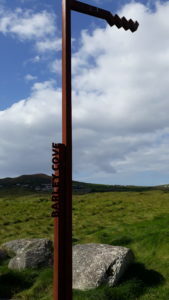 I took a few moments to visit some good memories I had of the area before continuing on towards Mizen Head. 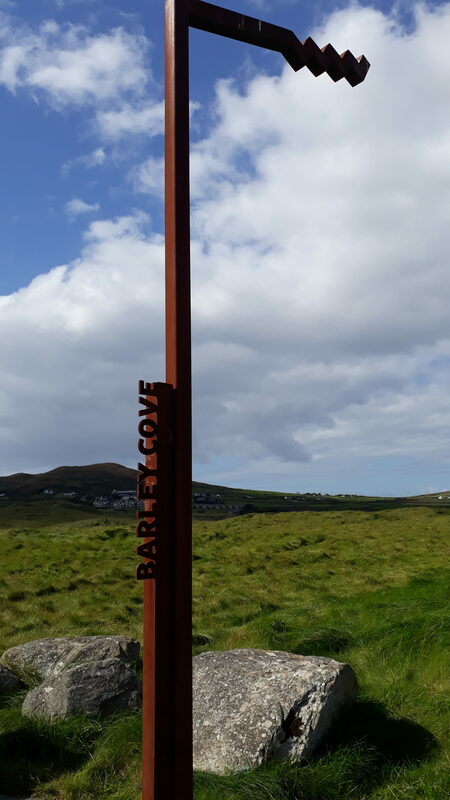 On route I passed Barley Cove where a film was being shot. Such a beautiful place and day for it. This looked like a very popular place for holiday makers. 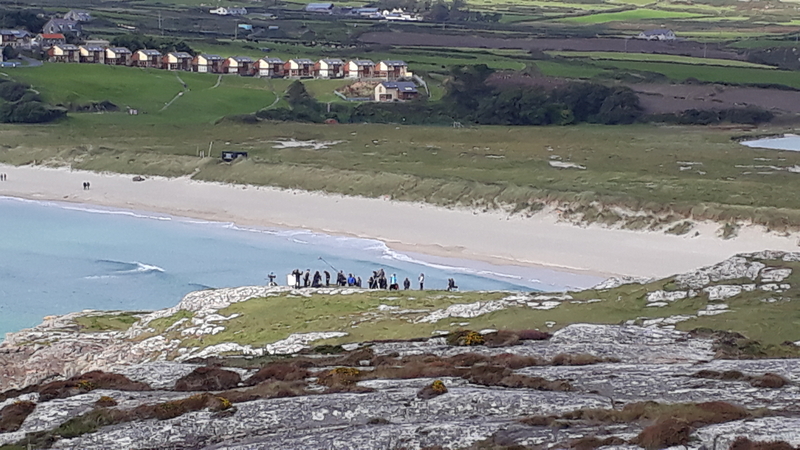 But today other than the film crew the stunning beach was deserted. I continued on some tiny little roads to Mizen Head. There was lots of traffic to contend with as many people seemed to be visiting Mizen Head as well. 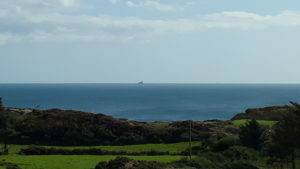 I was amazed at the difference between the development of Mizen Head in comparison to Malin Head. Mizen Head has a big restaurant. You can sit inside or outside; a large car park; a playground for children and a walk along the cliffs. Such a contrast to Malin Head with its mobile café! I sat and took in the beauty around me and because the day was so clear I could see Fastnet Rock in the distance.The Fastnet Lighthouse is known as The Teardrop of Ireland, the last sight of Ireland for emigrants sailing to America. 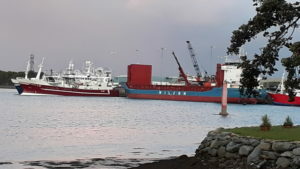 I had also heard about it in reports from some sailing competitions as it has very dangerous seas around it and numerous people have been rescued there. My lunch from the market in Bantry tasted so good as I sat outside watching all the various people meander around the complex. At this point I have cycled from the most Northerly part of Ireland to the most Southerly on the longest cycling route possible. 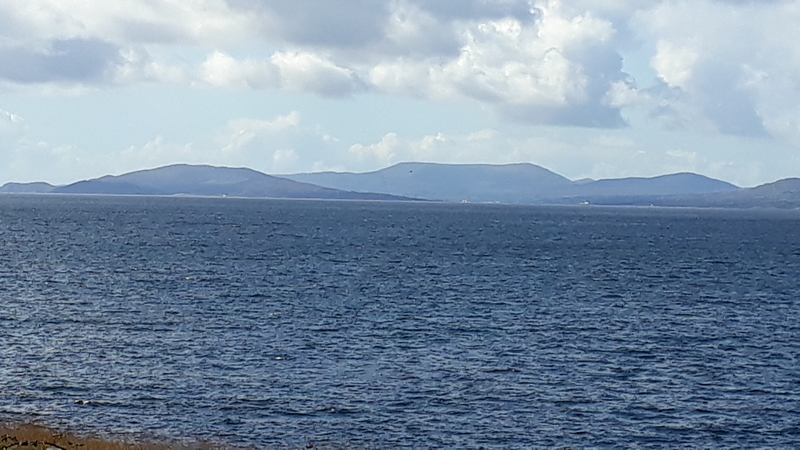 After a very pleasant break I turned to face into a fairly hearty wind on my way to Bantry. I was able to return on a different road so had more new views to take in. I stopped in Durrus and had a pint of cider as I was beginning to wilt a little. 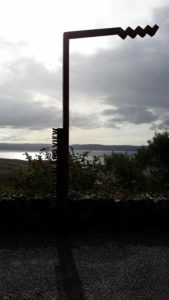 This gave me the lift I needed and I arrived back in Bantry feeling physically quite tired. It was a 100km round trip. I showered, had a bit of a rest and went in search of dinner. I found another nice hotel bar and had a very tasty dinner. This is my last night on my own. My last dinner on my own. My last B&B on this trip. I am so glad I have actually reached this far and have so many mixed feelings about it ending. I want to keep cycling but I do not want to spend any more time on my own. 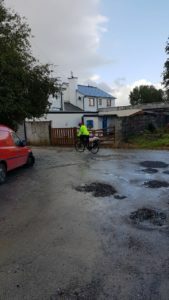 September 16th : After breakfast and farewells I hit the road for Ballydehob. I had quite an unexpected climb from Bantry to Ballydehob so I decided I had earned a stop and a very nice coffee in a the local health food shop and café. The next part of the journey took me to Skibbereen. I really like this town and had to keep reminding myself I could not buy anything as I was still on a bike! I decided to add in Baltimore as it is part of the WAW and I had plenty of time before I met my friend Margaret. Off I went on one of those round trips out and back. I don’t know what I was expecting but for some reason Baltimore did not live up to my expectations. Maybe I’m just tired and also the day was getting very dull. I sat outside a nice pub and finished off some of my bits from the farmer’s market in Bantry. I returned to Skibbereen in the rain and wind. Rarely have I managed to have a fully fine day. I eventually found the road to Drimoleague as it is not part of the WAW. My friend Margaret lives there and as it is only 10km from Skibbereen I was thrilled to go and visit with her for the night. I waited in one of the local pubs for Margaret to arrive and was entertained by a man who was walking around West Cork relaying his adventures to the lads at the bar. On Margaret’s arrival she gave me directions to her house and I cycled out ahead of her. She got some shopping for our dinner. Again I was stuck by the depth of my appreciation for my friends and the warmth of the welcome. I unpacked all my bags and was able to dry out my wet gear. Dinner, wine and a great catch up made my night. I slept soundly on this the final night of my WAW Cycling Odyssey. September 17th: The final day has arrived. It is bright, sunny and at this moment no wind-yippee. 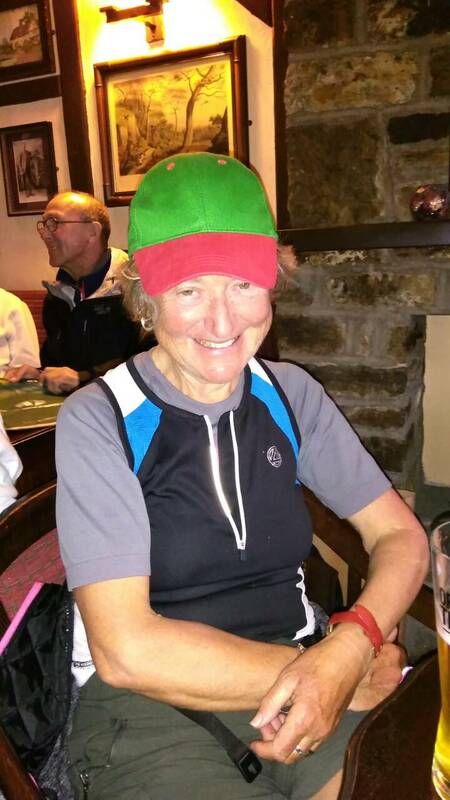 I chatted with Margaret over a healthy breakfast, packed my saddle bags for the final time, set the Garmin to record my final stage and I was ready for off. 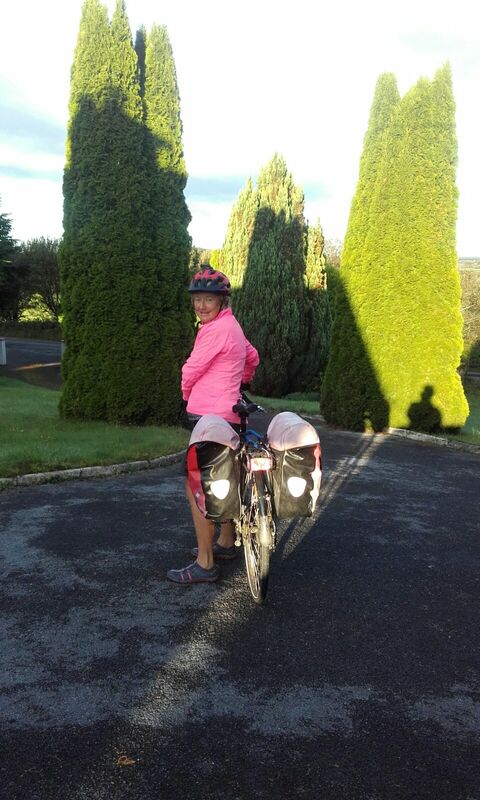 My spirits were high as I returned to Skibbereen and this time took the road to Clonakilty. This part of the cycle took me to Union Hall and Glandore. As it was early on Sunday morning I had these small roads to myself. 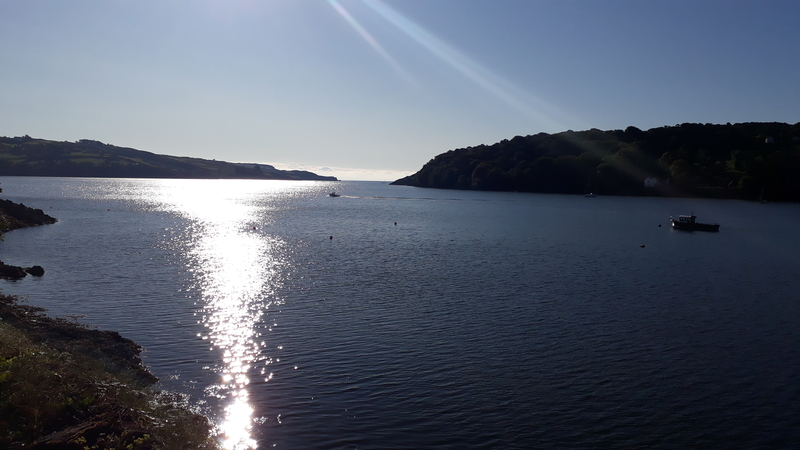 When I stopped in Glandore to take in the view I met two women out for an early walk. It was such an enjoyable experience to cycle up and down the roads with no wind. I was fascinated that this last day was looking as if it would be one of the best weather-wise. I stopped in Rosscarbery and took a look around at the town my parents had spent their honeymoon in 61 years ago. I’m sure it has made a lot of changes since then-I found it bright and cheerful on this sunny morning. On I continued to Clonakilty. The last time I was here all the streets were dug up as they had suffered very badly in the flooding earlier in the year. They did great job and the main street is so very pleasant to walk through. 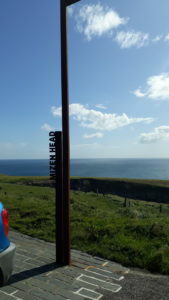 I stopped to ask group of young men the correct road to Timoleague, as yet again the sign posting was not great. The road to Ballinspittle is along the edge of the sea and very beautiful. But much to my profound disappointment/annoyance the wind arrived to accompany me the rest of my trip. I truly wondered did it think I was missing it too much. I almost cried. By the time I reached Ballinspittle I was ready for a break. Ballinspittle is the town associated with the moving statues of the 1980’s. For a few months back then people flocked to this little town to see or not see the statue of Our Lady moving in the grotto on the outskirts of the town. Well I can honestly say nothing moved today! I had a most lovely hearty bowl of soup sitting in the sun outside a café I remembered visiting before. A young couple with two kids were having their lunch. 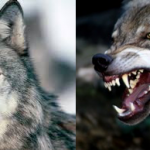 We struck up a conversation about the cycle. I was almost impressed myself with it as these two young people couldn’t imagine doing it!!!! After they left I had a conversation with myself and the wind. Would I continue on to Kinsale Head or let it go and make straight for Kinsale itself. I finally surrendered to the wind. It won. I had to acknowledge its superior power, bow down to it, stop fighting and head straight for Kinsale. My sister and brother-in-law Geraldine and Don were waiting for me there. I texted to say I was 10km away. 10km from the finish-2660km behind me…..
On the edge of the town I was met by two cheering, mad looking people running towards me- my welcoming party. I imagine the people nearby must have been wondering what was going on as we hugged and cried. I had completed the Wild Atlantic Way from top to bottom, and they were so proud of me. Texts came flying in as the completion photos were sent around to the rest of my family and friends. They were all so thrilled for me…….I didn’t know how I was feeling…. It was also All Ireland Football Final Sunday and Mayo were out to see if they could break their 51 year drought by beating Dublin. We unpacked the bike, locked it up and headed for a pub with a TV. Unfortunately Mayo lost in the final kick of the match. I truly felt so sad for them. Back to the car. Hitched the bike on to the bike rack and off we all went to Kanturk on this the final day of my odyssey. My physical cycle was over but my emotional and mental cycle was to continue.